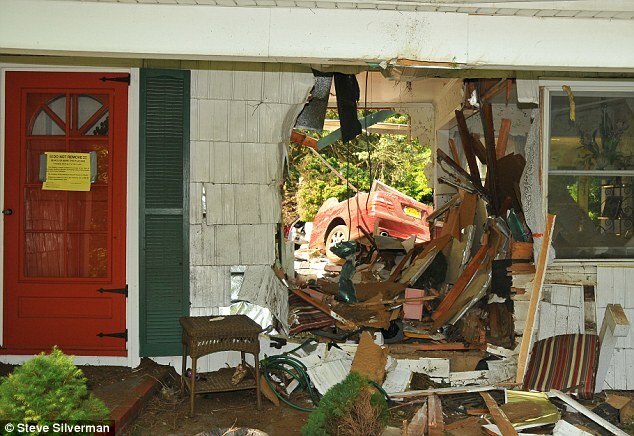 When I write a headline entitled “Crashing Through the House,” it’s most likely because the car and driver literally crashed through a house. We start our little story back in 2012 when 23-year-old Daniel Sajewski, Jr. crashed his father’s Mercedes in through the front picture window of a home and right out the back. You can see the picture here — in through the front and right out the back. Ya’ think there might be some law out of this? That’s why I’m here. You’re welcome. Let’s get started. And then there was the part about Sajewski asking his then-girlfriend Sophia Anderson to take the rap, and claim she was the driver. He promised, according to news reports, to cover her legal bills and take her on vacation. I’m betting you’ve already guessed that this deal, shall we say, came apart. Sajewski had, at the time, six outstanding warrants on six different cases, suggesting he was not exactly a leading light in his community. He’d been charged with drinking on the subway, possession of marijuana and failure to complete community service for a previous conviction. He had a record for petty theft and other drug possession charges, as well. Sajewski ultimately pled guilty to driving while intoxicated, reckless endangerment and making false statements. He was sentenced to one-and-a-half to three years behind bars. State Farm wanted its 180K back, and sued the driver, Sajewski, Jr. as well as his father, Daniel Sajewski, Sr., as Papa actually owned the car. Papa Sajewiski said, in effect, let me out of this suit because my ne’er-do-well kid took the car without permission. Not my fault! But. Not so fast. In New York, it’s not just drivers of cars that are liable for the damage, but the you see, the owners also. (VTL 388(1)). This makes sense because owners are in the best position to evaluate the competence of the people they lend their cars to. In the trial court, the judge said in legally sounding language, no way, no how, you ain’t getting out of this suit. Owners are responsible too. But Papa pointed out that, while there is a strong presumption of permissive use of the vehicle, that presumption is rebuttable. And look here at the two affidavits of Papa and Junior, both saying that there was no permissive use. Papa appealed. And yesterday, he got shot down again, this time by the Appellate Division, Second Department. So the question will, one day, go to a jury, where it belongs. Because questions of fact aren’t for the court. Daniel [Junior] had access to the appellant’s [Papa] residence. Further, the key to the vehicle was kept in a “central location” inside a bin located in the kitchen of the appellant’s residence. Additionally, on previous occasions, Daniel had been permitted by the appellant to drive other vehicles owned by the appellant. Just remember this story the next time you loan a car to someone that might be somewhat less than reliable. Because you can be on the hook.